While in Mecca from early last November until the first week of December to perform Hajj, GiLoCatur fell in love with ice cream. Yeap, you read it right, ice cream. 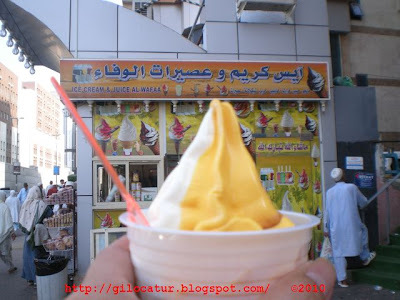 GiLoCatur had tasted manjo wa halib flavoured icream (manggo and milk) as you can see in below picture a couple of times. Its price is just only three KSA (Kingdom of Saudi Arabia) riyals. So, when GiLoCatur knew about Ice Room from Mazidul's blog (he is a TV3 personality and a blogger), GiLoCatur went to the ice cream restaurant located near Kota Damansara's Giants hypermarket to check it out. Mmmmmmm .... to GiLoCatur's satisfaction, Ice Room is the best place to have and enjoy ice creams in Malaysia. The following three different kinds of ice creams that GiLoCatur's family had on 18th December night before the final day of National Junior Chess Championship (NJCC) are the proof. GiLoCatur ordered Mango Pomelo Snow Ice which costs RM 7.90, a reasonable price for GiLoCatur because it has delicious and yummie taste. The important fact is that GiLoCatur can get the replacement for the ice cream that GiLoCatur had in Mecca. Fahim, GiLoCatur's youngest son, ordered the above ice cream. If not mistaken, the ice cream name is Passion Fruit Snow Ice (item #1008) while his elder brother, Fikri, had below ice cream. If you like it, you should order item #1004 - "Nut Case" Peanut Snow Ice. As you can see from the above ice cream menu, there are more than ten different types of ice creams that you can select at the Ice Room. For ice cream, it has two categories (like in chess tournaments eh! LOL) - the specials and the fresh fruit snow ice series. Not only you can have ice cream but also other types of food such as the variety of local delights, spaghetti and western delicacies. GiLoCatur impresses with its nice and beautiful decoration. The owner really knows how to attract customers and make the place appealing to visit. Another commendable feature of the restaurant is its children playground. Surely, it is very beneficial and a plus factor for parents with small kids. It is located upstairs at the first floor. 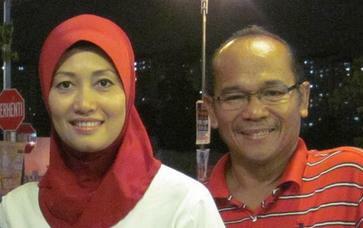 The ICE ROOM owners are Datuk Razali Mohd Daud and his "familiar face" wife, Datin Faridah Kassim. As GiLoCatur can recall, she is a TV dramatist in few decades ago. She welcomed GiLoCatur and family graciously while we entering the restaurant. Meanwhile her daughter heart-warmingly briefed about different types of ice creams in the menu when GiLoCatur and family made the order. GiLoCatur believes that Ice Room just opened in early November will be very popular and attract many customers for its delicious and tasty ice creams and first class service at very reasonable price. Keep it up! Twenty six and twenty seven votes were made for the NJCC poll for the boys and girls category respectively. The poll results are basically correct. Lim Zhou Ren received the highest vote of 31% for the boys category. In the girls category, Alia got the majority votes of nearly 60%. GiLoCatur would like to thank all who had participated in the poll. 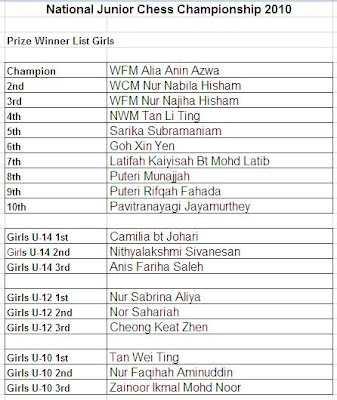 Below are the official winners of the Malaysian 3rd National Junior Chess Championship that just concluded last weekend. It was emailed to GiLoCatur by Mr Marcus Yeoh, the tournament's deputy arbiter. 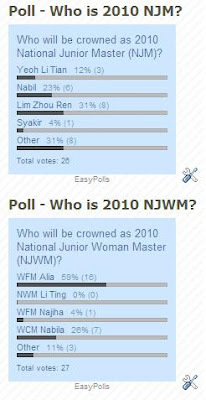 especially to the new NJM (National Junior Master), Lim Zhou Ren, and NJWM (National Junior Woman Master), WFM Alia Anin Azwa Bakri. 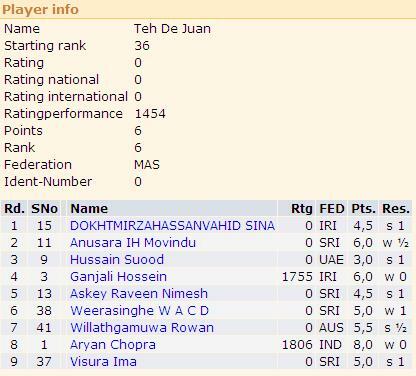 There were two FIDE-rated chess tourneys concurrently being held in Malaysia that just concluded yesterday. 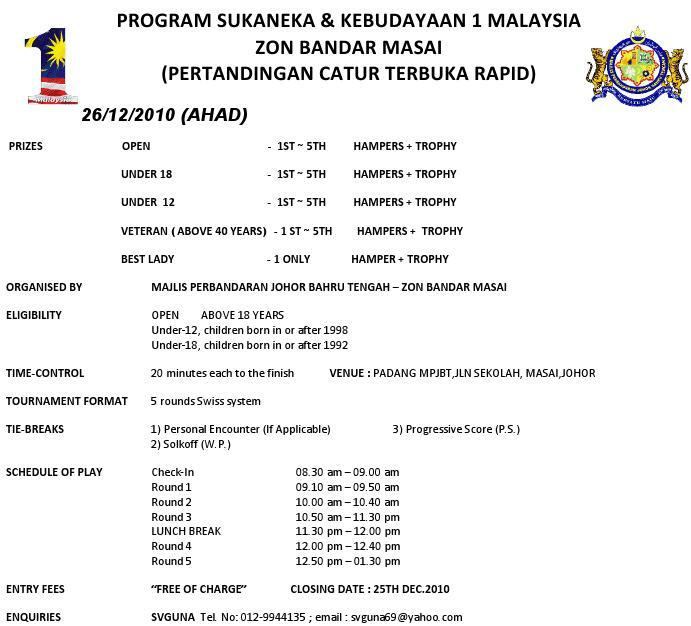 One was held in Kuala Lumpur specifically for the Malaysian Under 20 juniors while another one was held in Sibu Kuching. The former is known as The National Junior Chess Championship or NJCC in short while the later is the Sarawak Open Chess Championship. So, how's the results or final rankings for the tournaments? While GiLoCatur left the venue for the NJCC, playoff was underway to determine the champion since five players have same 7/9 points. For the chess tournament, tie breaks is not used to determine the champion if top final rankings have same points. In the final 9th round, Mark Siew could not earn the minimum 1/2 point when facing Syakir in the top table battle. 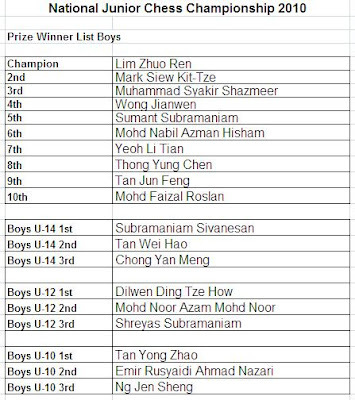 Instead, Syakir who was trailing Mark by a point managed to equal the 7/9 score not only with Mark, the leader after Round 8, but also with three others - Sumant, Zhou Ren and Jian Wen. Nabil or Li Tian could not join the fray for the playoff when both just drew against each other and scored 6.5/9 points. In the girls section, WFM Alia and WCM Nabila had to play the playoff when the two had 8/9 points. Eventhough, the former had better tie break, both of them had to play the playoff to the determine the new Malaysian NJWM, National Junior Woman Master. GiLoCatur does not have the official result for the Sarawak Chess Open. But based on chess-results.com here, Jasur Madjidov from Uzbekistan, won the first place after scoring 6.5/8 points and better tie breaks than two other players - Foo Chee Kin and Morsin Ahmad, who have the same score. More than 50 players participated in the three-day event that started on Friday. An informal bloggers gathering is being arranged and organized by Mazidul of http://www.mazidulakmal.com this weekend night (Saturday, 18th December) at the ICE ROOM, Kota Damansara at 9 o'clock. 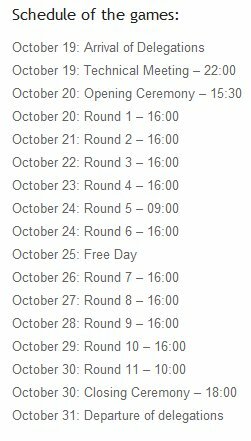 So, to all Malaysian chess bloggers, you should go to the gathering, don't you think? Click here to read some update on the second day of the 3rd National Junior Chess Championship. Malaysian chess players especially the juniors should wear smart and elegant dress or attire during chess tournaments like the above Mister. Wearing "selipar Jepun" should be a NO NO in a local chess tournament like NJCC. Isn't it a Fide-rated and national-rated event by the way? GiLoCatur was at the venue of the 3rd National Junior Chess Championship that is scheduled from 15th until 19th this month. 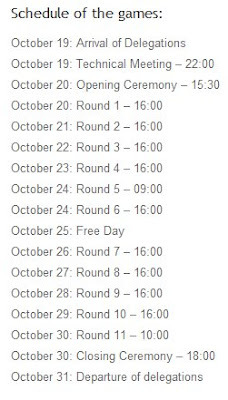 It is the first tournament that GiLoCatur attended since being absent from the local chess scene due to the Hajj pilgrimage. As usual, GiLoCatur took pictures to share with this blog's visitors. Busy verifying and confirming the participants / players list. More pictures can be viewed here and here. The Penang Heritage Chess Championship just ended last Sunday. 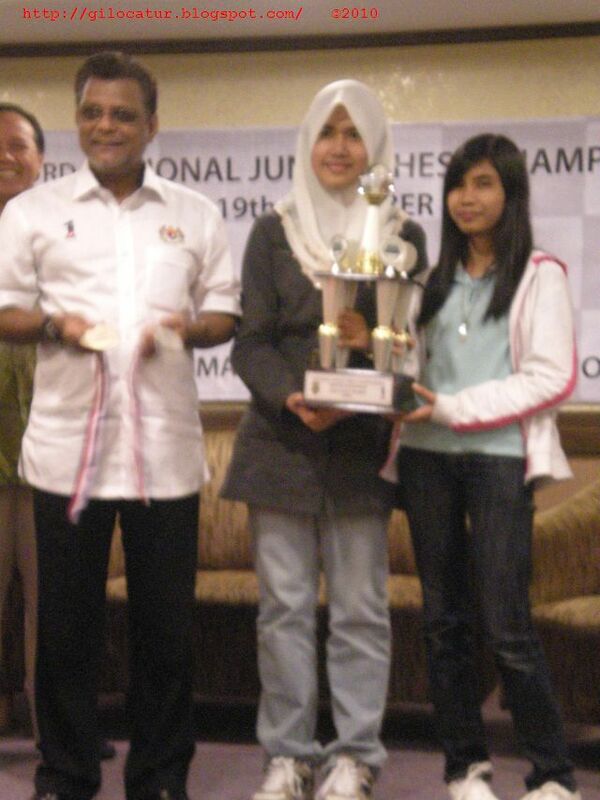 Now, the focus of chess in Malaysia will be the 3rd National Junior Chess Championship. It will be held at a hotel near the Merdeka Stadium known as Hotel Olympic tomorrow. The championship has two categories - one for the Under-20 boys and one for the Under-20 girls. The champion for the boys will be awarded the title of NJM or National Junior Master and NJWM or National Junior Woman Master for the girls. 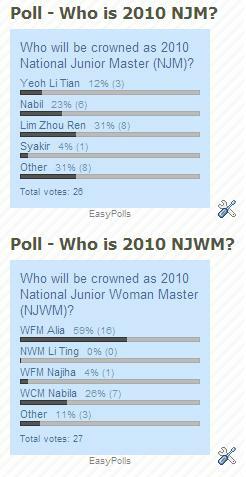 Do you know who is last year's NJM and NJWM? If you don't know, click here to find the answer. The list of participants has been published here. Based on the list, the number of participants for the boys is 71 and for the girls is 32. 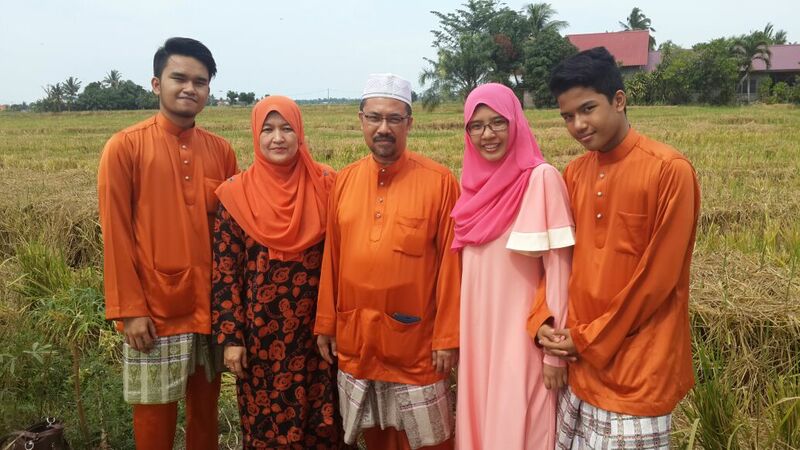 GiLoCatur's eldest son, Fikri, and daughter, Anis, will take part too. They have not participated in any chess tournament for two months since GiLoCatur and wife went to Mecca for the Hajj pilgrimage. 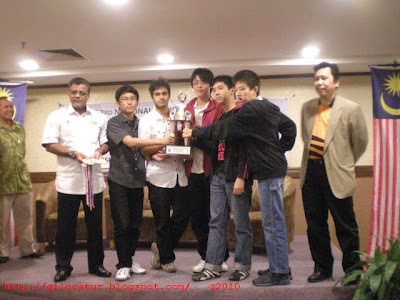 The last chess tournament they participated is the National Rapid Chess at the Universiti Teknologi Petronas (UTP). So, who do you pick to win the NJM and NJWM titles? Teh De Zen (below picture, MSSM 2010) had made history and proud her parents for being the champion of the Under 9 Girls category in the 6th Asian Schools Chess Championship held in Sri Lanka. GiLoCatur would like to congratulate (Syabas dan Tahniah) her for the achievement. GiLoCatur would like also to congratulate her dedicated parents - Mr and Mrs Teh. She had won all her nine games as per below chess-results.com data. De Zen's brother, De Juan, who was participating in the Under 9 Open category also had good performance after securing 6th place with 6 points from 5 wins, 2 draws and 2 defeats. BRAVO De Juan! 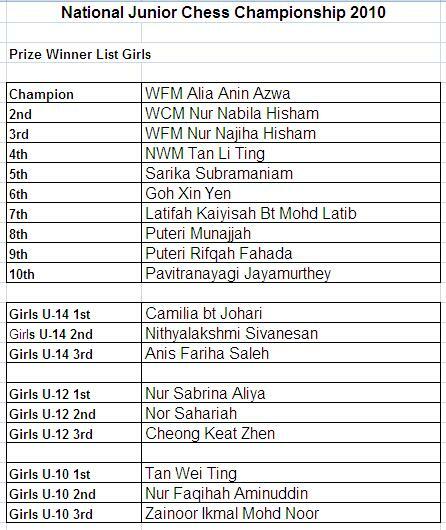 Hopefully, this achievement will motivate not only De Zen but also other Malaysian junior chess players including GiLoCatur's kids. Keep learning, keep practicing chess! Please click Masai Pedia blog to know more about the town. Below is the email GiLoCatur received from Mr Guna Balan regarding a FREE chess tournament that will be held in Masai, Johor during Christmas festive weekend. 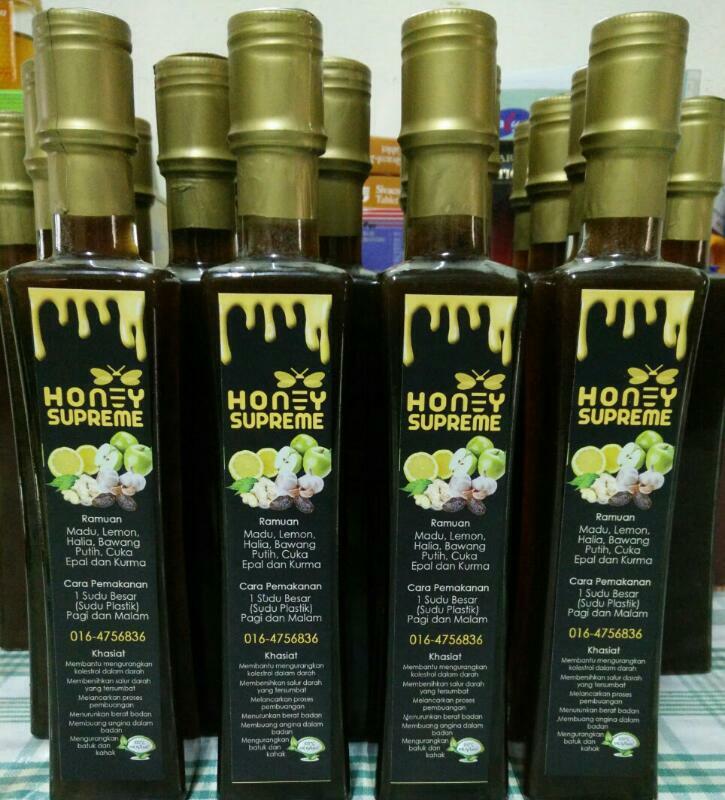 Keluarga 1Malaysia Zon Bandar Masai). Tarikh : 26hb. Dis 2010. Tempat : Padang MPJBT Masai. Waktu : 8.30 pagi ~ 1.30 ptg. Seeing the above Round 5 results of the Challenger category, the top three boards show interesting results. The higher seeds were defeated by the lower seeds. For GiLoCatur, this scenario is good and healthy. It will uplift and increase the standards and quality of chess in Malaysia. It will provide competitiveness and challenge. So, going to the sixth round there are three players have the perfect 5/5 score - Jun Hao, Xian Hui and Muhd Zikri, the son of Mat Zaki Yeop. On the top board, Jun Hao will face Muhd Zikri from Perak. Good luck to all the players. The results of Malaysian players against foreign opponents are not impressive this morning in the fifth round. IM Mas could not stop his opponent, IM Dimakiling, from scoring the perfect 5/5 point on the top board. Nabil could not win over FM Castellano. Li Tian could not steal any point playing black versus the second seed and only GM in the tournament, Murshed of Bangladesh. Only NM Edward managed to draw with IM Chiong Zacarias. Round 6 is being played at the moment. The Malaysian players at the top five boards are only Eng Chiam and IM Mas who face FM Castellano and FM De Ramos respectively. Good luck to all the Malaysian players. Fight and play till the end! 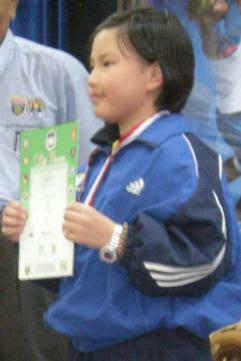 Teh De Zen (above picture) is leading the Under 9 Girls category with perfect 4/4 score in the 6th Asian Schools Chess Championship being held in Colombo, Sri Lanka. She represents Malaysia in the tournament scheduled from 7th to 12th December 2010 along with her brother, Teh De Juan who participates in Under 9 Open category. 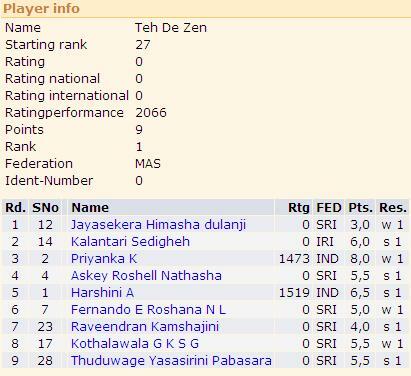 De Zen managed to win against the second seed, K Priyanka of India, in the third round playing white. The victory was highlighted in Lankachess.com website as per below picture. Best of luck to both De Zen and De Juan in the tournament. GiLoCatur hopes and prays that they can be the champions of their respective categories to make our beloved country proud and establish their reputation in the international chess scene. Yesterday (just two hours passed by he he he) was the start day of the Penang Heritage City International Chess Open. Two rounds out of the total nine had completed. 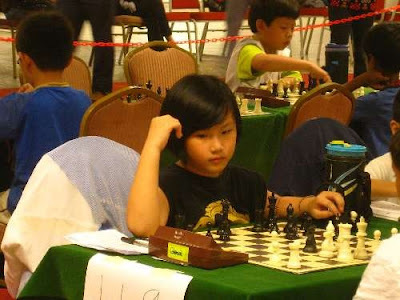 The chess tournament was held at Dewan Seri Pinang situated in the famous Penang island. There are two categories - the Open and the Challenger. 71 players are in the former category while 109 participants are in the latter. 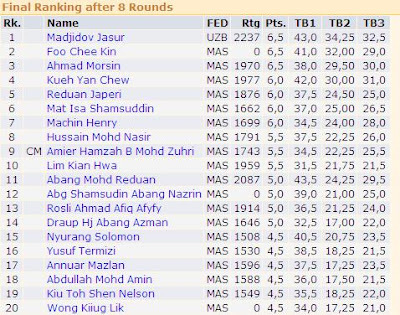 In the Open category, IM Mas Hafizul who is seeded third leads the Malaysian chess players. Yeoh Li Tian who helped the Malaysian contingent become the champion of the recent 2010 APSSO is the 21st seed. Yeap Eng Chiam, B15 MSSM individual champ, is one rank higher. Can they with other Malaysian chess players provide the challenge to the Pinoy players that include Malaysian-based Ian Udani? In the first round, all the above three Malaysians won their respective games. IM Mas beat an Indonesian player while both Eng Chiam and Li Tian won over Malaysian opponents. Tan Jun Feng had a good start when he drew with the top seed, IM Oliver Barbosa. In the second round, Eng Chiam could not manage to upset the 2nd seed, GM Niaz Murshed of Bangladesh. IM Mas continues his winning streak against a countryman player while Li Tian managed to draw with the 5th seed Pinoy. Wong Jian Wen, a MSSKL chess player, had a great victory against higher-seeded Fide Master (FM). Such kind of result that we want our junior chess players to achieve. In the Challenger section, a chess blogger named Yat Guo Jie is the top seed. 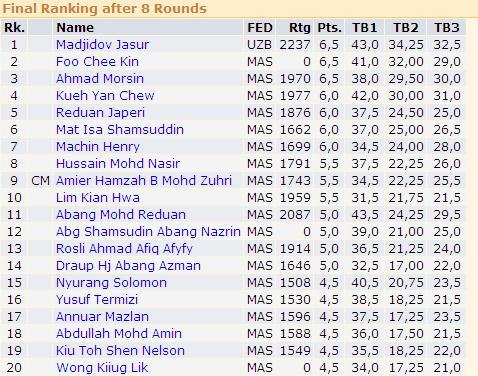 Most participants are Malaysians and juniors as GiLoCatur observes based on the players list in chess-results.com. Of the top 10 boards, both the first and the third had draw results. In the second round, based on the results in chess-results.com, the second seed was defeated by lower seed opponent. Today, two more rounds will be played. How's the results would be? Let's wait and see! Hari ini merupakan awal tahun bagi kalendar Islam tahun 1432H. 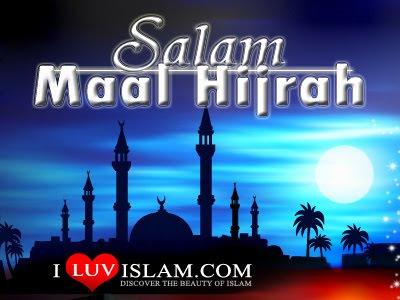 Kepada semua umat Islam terutamanya rakyat Malaysia, GiLoCatur ucapkan Selamat Tahun Baru Hijriah! Semoga di tahun baru 1432H kita akan lebih cemerlang dan berjaya. Amin Ya Rabbil A'lamin. 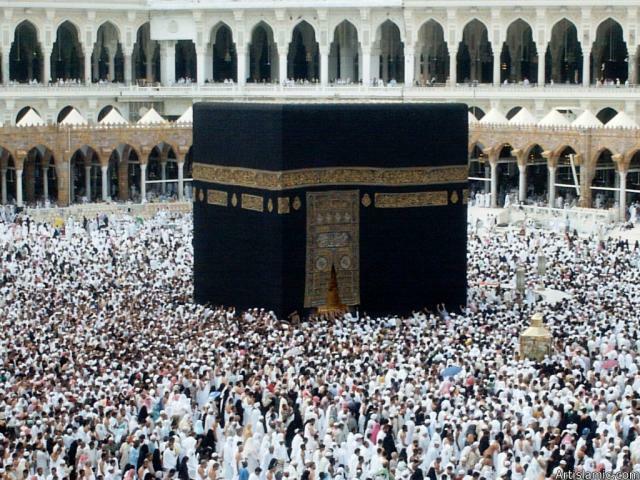 Alhamdulillah, GiLoCatur and wife had been backed home from Hajj in Mecca this early morning. GiLoCatur had been away especially from the "chess stage" for more than 40 days. Eventhough still tired and jetlagged after more than four hours delay flight from Jeddah yesterday, GiLoCatur could not resist from updating this blog. GiLoCatur was out of touch with local chess news since had to concentrate on the hajj mission and activities. One sad news that someone had texted GiLoCatur is about the demise of the late Mr Lim Chong. Hopefully, the condolences that GiLoCatur wished was relayed to his family. By the way, GiLoCatur would like to convey the condolences again to Mr Lim's family. GiLoCatur would like to apologize to this blog readers and followers for not telling about the hajj mission. GiLoCatur thinks it is better be personal. So now, it is back to normal. GiLoCatur and the children have to skip the Penang Heritage due to no more leave.